Editor's note: The man behind the original Doink character, Matt Borne passed away on June 28, 2013. Our thoughts and prayers go out to his family, friends, and fans. Rest in Peace. I may be one of the few people out there who actually enjoyed Doink the Clown. When he first showed up in the WWF in late 1992, a lot people criticized the gimmick. I loved the idea of an evil clown terrorizing not just the fans, but the babyfaces too. 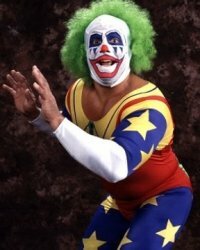 Doink for those who don't know was played by Matt Bourne, who wrestled on the very first Wrestlemania against Ricky Steamboat. He worked in regional promotions like Pacific Northwest and World Class, achieving success in tag team competition. In the early 90's he was WCW's Big Josh, a babyface lumberjack who held the 6 man tag team titles at one point. I feel like Doink really allowed Bourne's personality to shine. It's similiar to how Goldust brought out the best of Dustin Rhodes. 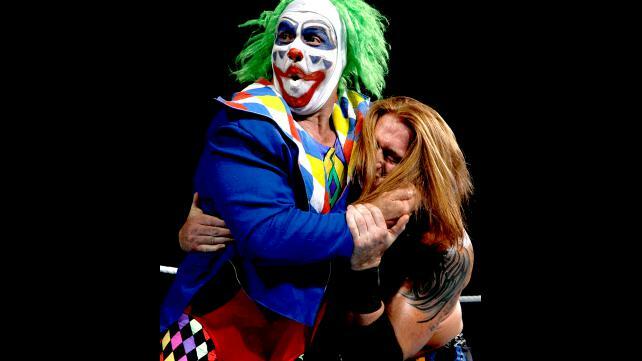 Doink's feud with Crush was quite memorable to me. The two battled it out at Wrestlemania IX. I figured Crush would crush (pardon the pun) his opponent. But the clown outsmarted the big man and a second Doink helped secure the win. Nearly 20 years later, I still mutter the phrase "It was an illusion" the same way Bourne did after the second Doink scurried back under the ring. Like all good things in wrestling, the heel Doink finally came to an end. It was on an episode of Monday Night Raw in the fall of 93 when the clown threw a bucket of water or confetti on commentator Bobby Heenan. A feud with Bam Bam Bigelow and Luna Vachon would follow with Doink picking up a little sidekick Dink. By this point the gimmick jumped the shark and was painful to watch. There's still a version of Doink on the indie scene and we've seen some form of him on Raw recently, returning to battle Heath Slater. It was the one match the One Man Band won in his battle with the legends. Yes, I just used legend to describe Doink. Some may disagree, but I was down with the clown, and one of these years for Wrestlemania I'd love to dress up like him.